Baxter, Edison, Zelda and Edna. Cute, cute, cute and cute. 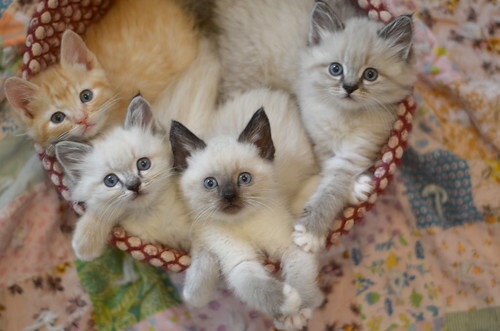 I've think they've logged more time in this basket than any other litter. They just fit so perfectly inside. And they must really like it. I love this quartet! It looks like Edna's face stripes are an itty bitty bit more pronounced, tho Edna & Eddies pouty faces are so similar to me. Do you wash the basket or does it smell like litters gone by...just curious. Also, Zelda is one of my most favorite names EVER. It's machine-washable so it gets washed between litters. My foster kittens liked to camp out on top of the little kitty condo I had for them--not inside it. They were named Charlie Brown, Snoopy, Linus and Lucy, so I guess it's appropriate that they slept on TOP of the kitten house instead of inside. Just like Snoopy and his doghouse! Like the Lamms, they were cute and snuggly and more cute than should be legal. I don't think it has anything to do with Charlene. It's a cozy space, it's warm, it's large enough for four to sleep or two to wrestle comfortably. They don't seem traumatized - nothing's ever indicated they had a rough start. I love how they are arranged so they make a heart shape inside the basket. It's nice they've found a "safe" home base in the scary world with big floofy cat monsters (sorry, Bean, they'll learn to love you lots really soon!). Um... I studied hard after my Lamm lesson the other day - isn't that Edison on the right with the orange on his nose?? Nope, that's Edna. She's darker and her coat is woolier. She has a light smudge of rust on her cheeks too, but his is a little more distinct (although it's hard to see in this photo). I'll take two of these baskets to go please. Adorable! I think I'm finally able to sort them out - thank you for all of your cues, Laurie. I've also noticed that Edna has white paws! Zomg... so incredibly adorbs. I love their little faces and paws!! I love these babies. I have only one request. As in the past you have sometimes had dining with the ..... I would love a dining with the Lamms. I so adored the "dining with the Dearborns" and would love to see how darling little Eddie get food on his chin lol. Perfect composition! Lovely family photo. This bunch is amazing.And the white toes at the end of the creamy legs are particularly appealing. I just wonder at the genetics of white kitty toes. Only wish I would give them all a cuddle. Soooo cute!!!! They are all so pretty - I love the names you choose for each litter. Any chance, laurie, that you'd eventually have an entire set of postcards just for the Lamms? They're so SO cute! I had to use this picture as my desktop picture. I teach computer skills to 400+ 8 - 12 year olds, and we only have 3 weeks of school left. Just having these beautiful babies on my screen allows me to calm down and it takes my stress away. They are beautiful, and I ALWAYS tell anyone who asks where I got the picture.